The Danish artist Tue Greenfort presents new work in his second solo exhibition at KÖNIG GALERIE: "Danish Pigs and other Markets." 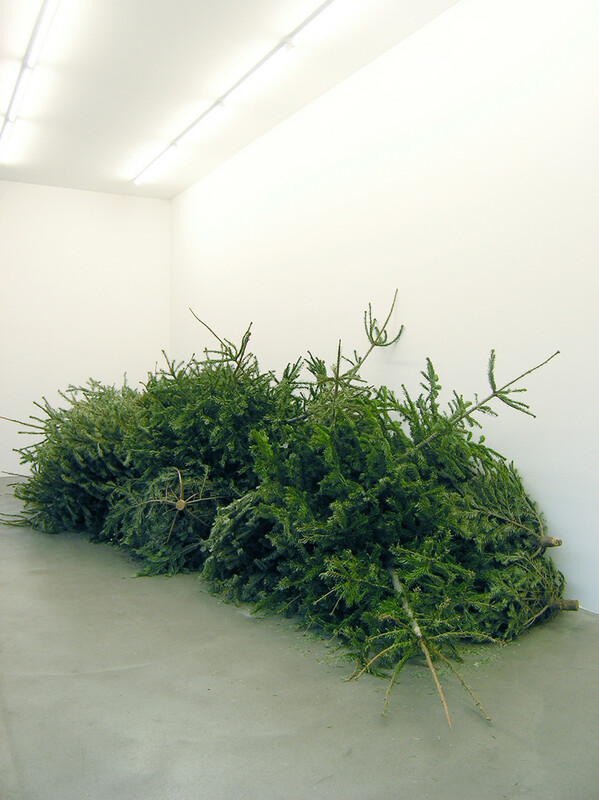 A large heap of Christmas trees, taken from the streets of Berlin, lies on the gallery floor. 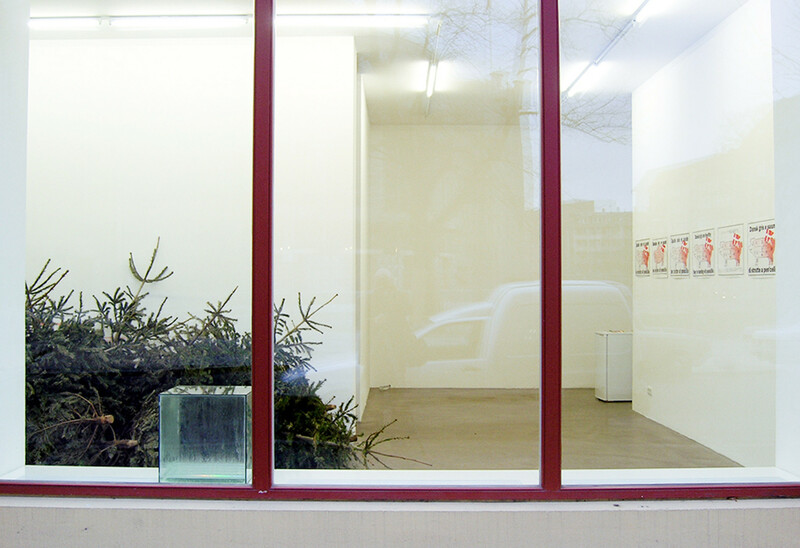 On the wall behind the heap is the following text: “Flexible Christmas Tree Collection”, a free service from Berlin Refuse Disposal (BSR) that collects trees deposited on the streets of Berlin until 22nd January.In the exhibition, posters by Mikael Witte, also a Danish artist, play a central role. From 1978 to 1995, these posters highlighted the serious shortcomings of the pork production industry in Denmark. 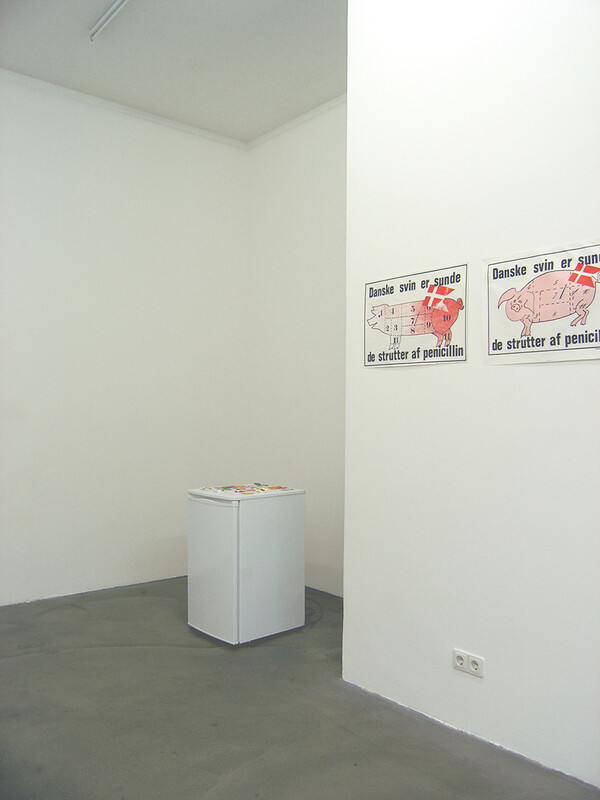 The first poster of 1978 created great controversy; representatives of the pork production industry sued Witte for illegal use of their logo and tried to stop the poster being displayed. Witte made reference to this in his later posters, also exhibited here. Greenfort has consciously chosen to present a work by another artist that he then develops by adding a graphic work of his own. A further reference to the work of another artist is Hans Haacke’s “Condensation Cube”, a glass cube containing a very small amount of water, which causes condensation. 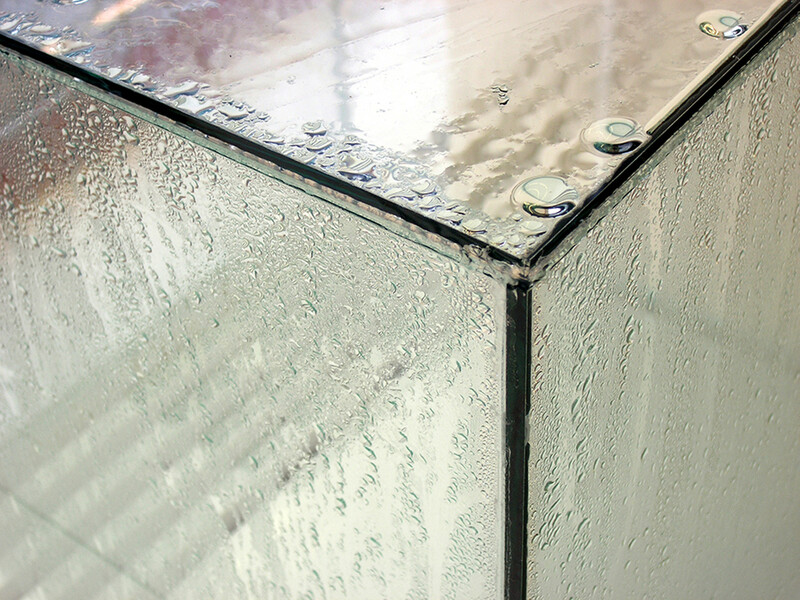 Greenfort’s cube, however, is filled with BONAQUA water: a brand name product from the Coca-Cola company. 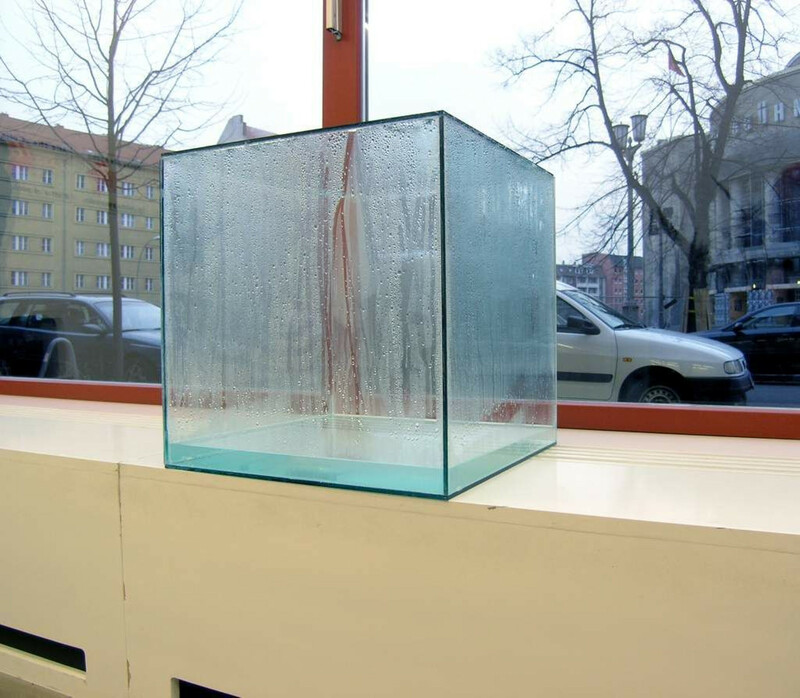 The Condensation Cube is one of Haacke’s early works, and has already been referenced by other artists, for example, Olafur Eliasson. Greenfort also uses the element of water is his piece “Producing 1 kilogram of PET plastic requires 17.5 kilograms of water”: a 1.5 l water bottle melted down to a volume of approx. 0.5 l. Here, Greenfort comments on PET plastic bottle production; more water is required to produce each bottle that is ultimately contains. 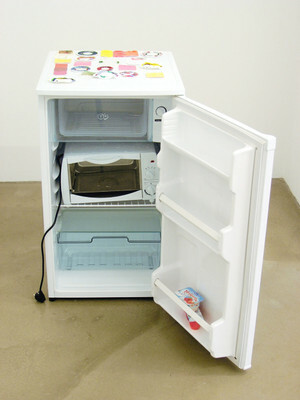 The “Corner of the Month”: a fridge combined with a small oven, containing different varieties of yoghurts. 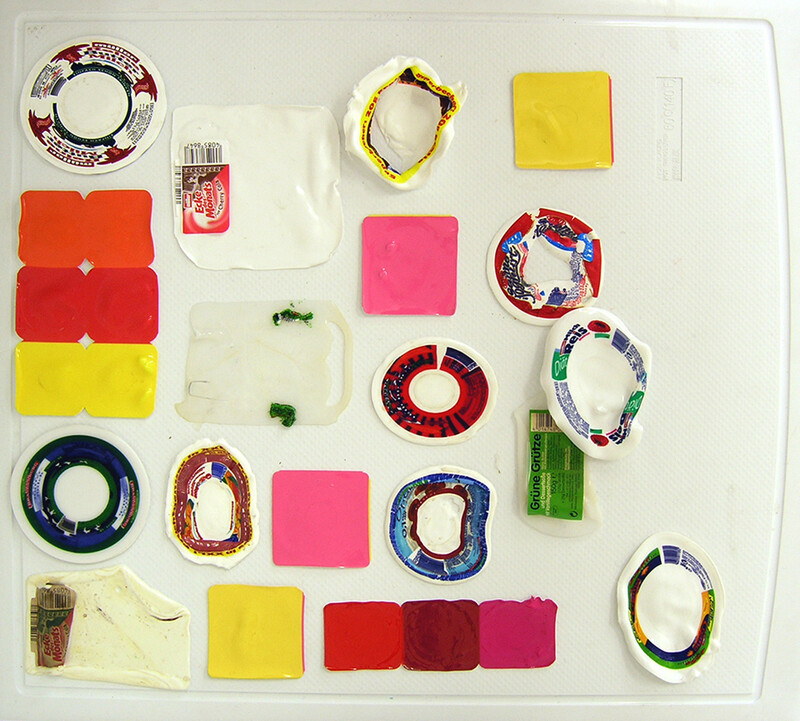 The fridge acts as a podium for the yoghurt pots previously melted down in the oven. Greenfort examines the absurd necessity of the food industry to constantly develop new products, using a large amount of energy to do so, like, for example, Dr. Oetker’s “limited” Chocolate Juice Drink or Müllermilch’s “Corner of the Month." 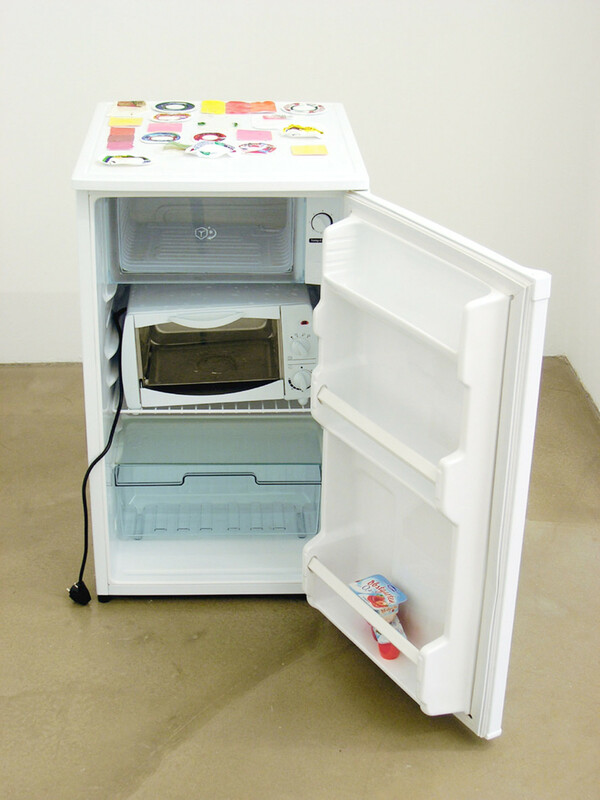 Greenfort’s work is characterised by the way he processes his environment; he uses products, and the work of other artists, and also refers to the approaches of other artists, for example, Witte’ attempt to aestheticise political themes. 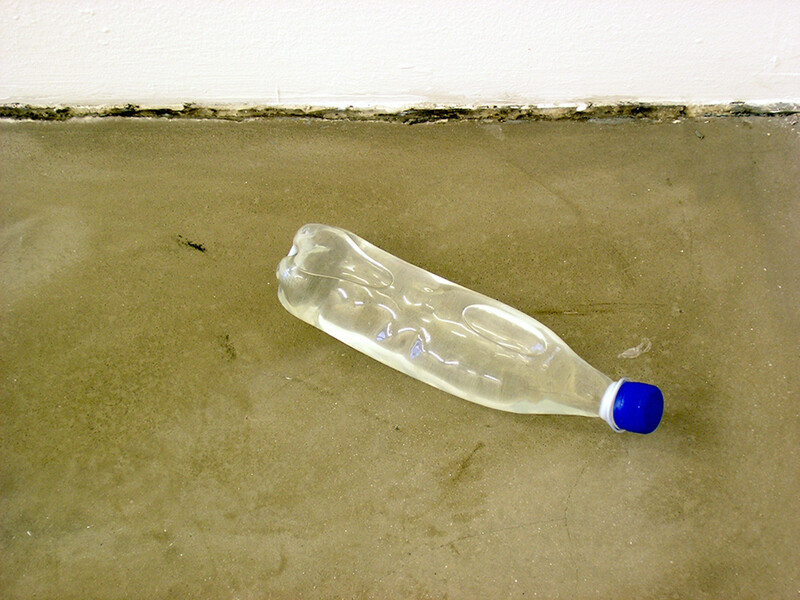 Greenfort makes references to a broad range of everyday problems and tries to find artistic solutions. Although a heap of Christmas trees loosing their needles in a gallery in January may well be a spectacular sight, the exhibition, “Danish pigs and other markets” is not, in the first instance, concerned with art itself; it focuses rather on more sober observation. In his concrete presentation of objects, the fridge, the Christmas trees, the plastic bottles, Tue Greenfort comments on our expectation of visual complexity using images that are apparently simple. The objects themselves may indeed be simple; however, an artistic work is created when they are melded into a composition of associative elements. Tue Greenfort contrasts banal everyday products with the grotesque background of their production and marketing and indirectly asks about responsibility; rebellion has been transformed into discreet attentiveness. Through the visual appropriation of an early work by Haacke or the presentation of posters by the Danish artist Mikael Witte, Greenfort indicates how our perception has changed. While earlier provocative critiques of society concentrated on revolution, this critique now seems to be more measured, reflective and reformatory in nature, although its goal has not changed. This defusing of ideological fronts has led to the transformation of consumer expectations into marketing slogans: “Christmas Tree Collection” is a response to customer requests. And if the voice of the consumer is equally the rhetoric of the manufacturer, how can responsibility now be formulated? Seen through the inductive optic of Greenfort, we can still continue to recycle and remodel: both products and our understanding of them.